Two wolf dogs who starred in 'Game Of Thrones' are helping drive a surge in the rare breed's popularity. The owner of Odin and Thor, two Northern Inuit dogs who played direwolves in the hit HBO fantasy drama, is facing a growing number of enquiries about pups and has even turned down offers from celebrities wanting to buy the family pets. 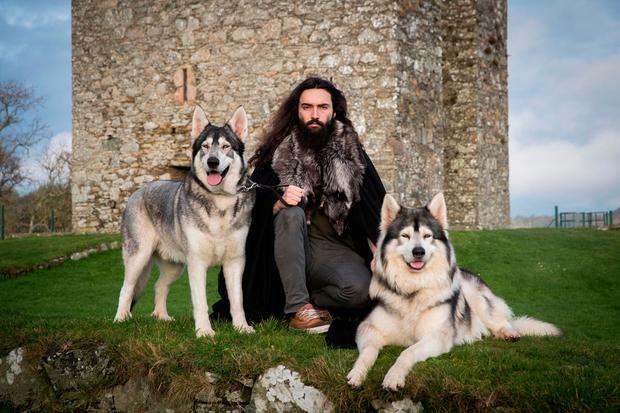 William Mulhall, from Co Down, said his dogs, who have their own Facebook, Twitter and Instagram accounts and are insured for £1m (€1.12m) each, have met about 400,000 people in the last four years on the back of their roles as direwolf pups Summer and Grey Wind in season one of 'Game Of Thrones'. "Odin and Thor are Northern Inuits, which is a wolf lookalike breed, the closest thing to wolf we can get without a licence," said Mr Mulhall. "Their parents were brought in from England, making these the first to be born in Ireland ever - that's how rare they are. "Usually when you see a wolf on TV or in a film it will be this breed of dog, because they are so wolf-like in their appearance and so highly intelligent. "And that's why we got them - we just wanted cool dogs," he added. Three weeks after buying the pups seven years ago, Mr Mulhall got a call from the breeder saying a TV show was interested in using them. "I was like, 'cool, what's the show about? ', and the breeder said, 'I don't know - swords and shields and stuff'. "So I brought the dogs up to the breeder's house and the trainers from 'Game Of Thrones' were there and they picked these two to be in the show as direwolf pups." Odin and Thor are not the only members of the family to end up as part of the 'Game Of Thrones' story. Mr Mulhall has appeared as an extra in the series, while his father played a Dothraki slave master. His two brothers have also been involved, as has one of their boats. The dogs are now a regular attraction on the burgeoning 'Game Of Thrones' tourism circuit, where fans from all over the world visit the locations used in the series. "A lot of people come here now just because of 'Game Of Thrones'," said Mr Mulhall, who is investigating the possibility of using Odin to father a litter. "We are looking to keep the blood line going and have a few sons out of Odin," he said. "He's had quite a lot of popular demand asking for pups, so we'll see what happens in the future."